Steve Achelis is a software entrepreneur and the developer of vRigger. Programs that were designed or written by Steve have been sold to more than 300,000 customers in more than 100 countries. Steve is also the former Commander of the Salt Lake County Search and Rescue Team, a member of the Brighton Ski Patrol, a rope rescue instructor at the University of Utah, an EMT and WFR instructor, the author of several articles on rescue physics, and the author of Mountain Responder—When Recreation and Misfortune Collide. Tom Moyer is the lead mechanical engineer on vRigger. Tom is the former Vice Commander of the Salt Lake County Search and Rescue Team and was a member of the Snowbird Ski Patrol. He was also a member of the Rocky Mountain Rescue Group in Boulder, Colorado and the Denali Search and Rescue Team. 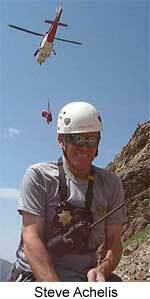 Tom is an experienced climber and mountaineer who has published numerous articles on rope rescue testing. Tom has engineering degrees from Stanford University and MIT.